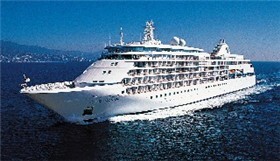 Silver Spirit, Silversea's newest and largest ship, is now sailing the world's oceans. Ralph Grizzle, our senior contributing editor, had the opportunity to sail on this ultra-luxury line's newest vessel in late 2009. Ralph, a senior contributing editor for SouthernCruising.com and editor/publisher of AvidCruiser.com, provides his unique perspective about the new the ship's "Vibe"! 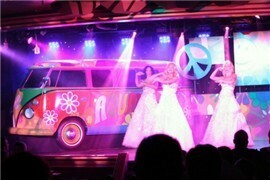 Photos of Christening - New Silver Spirit! Christenings are a once-in-a-lifetime event for a ship. You can always expect plenty of pomp and circumstance for guests at the ceremony as well. 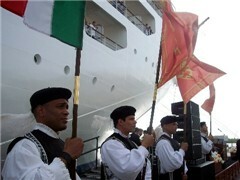 But in the case of the new Silversea Cruises' Silver Spirit's christening in Port Everglades in early 2010, there was also lots of Venetian flair. Come along as we go first-hand to the naming ceremony for this biggest ever Silversea vessel. Enjoy the photologue! If you're seeking ultra-luxury at sea on a small to medium-sized ship, Silversea Cruises just may be the right line. With its four vessels serving from 296 to 382 passengers, the line offers a high-quality, highly inclusive onboard product. Silversea's dining includes Relais & Chateaux signature dishes, an alternative dining experience, open seating in The Restaurant, and 24-hour complimentary room service. Wine cruises, golf cruises and culinary experiences are among the itinerary options. From the southern U.S., the line sails each winter in the Caribbean. So come along with cruise expert and journalist Georgina Cruz, as she relays information about the Silversea cruise experience.